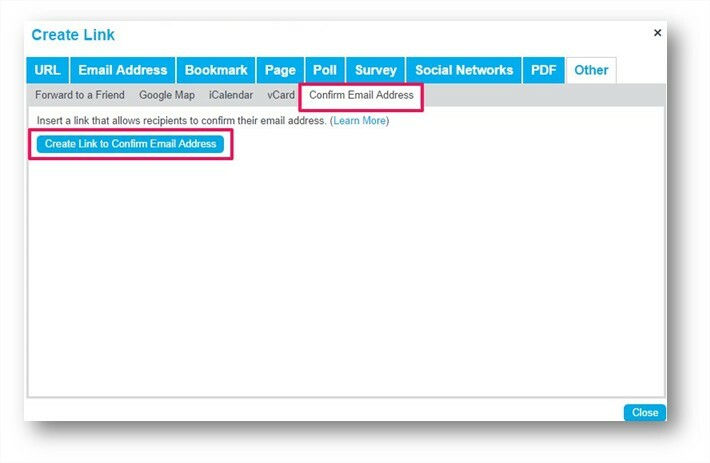 The Confirm Email Address Link is an automatically generated link that allows you to setup a single opt in process for recipients to confirm their consent to receive emails from the sender. This can now be placed into Campaigns to allow the user to opt in with a simple click. Click to the Content step of an In Progress campaign or edit a template you own. Click the Other tab, and select Confirm Email Address. Click the Create Link to Confirm Email Address button. The contact will need to click the link in the email they receive in order to complete the confirmation process. For more information on Confirmed Opt In/Double Opt In click here. To search for contacts who require confirmation please click here. How do I locate the contacts in my account that require confirmation?